Did You Go to Hong Kong Just to get Brain Surgery? I’m not sure where this rumor started, although it may be related to the fact that there was an article in the New York Times on medical tourism right around the time all of this was happening. But no, I didn’t go to Hong Kong to get brain surgery. I went there to see a very good friend of mine, and to visit a blow up doll factory (more on this later). This photo was taken with my phone, at the exact moment I discovered I had a brain tumor. 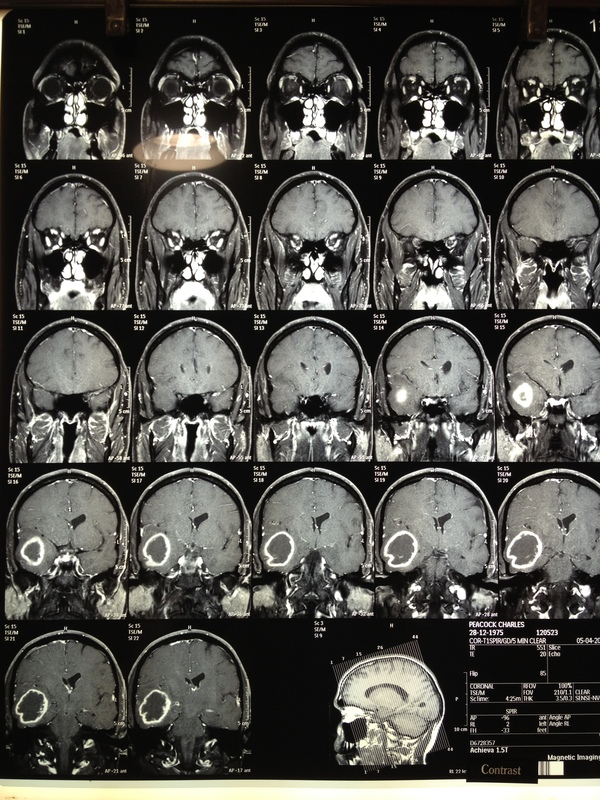 What you’re seeing is a partial MRI scan of my brain, starting at the front of my skull (the top left image) and proceeding backward to about the middle of my head. Here’s the story: after I got to Hong Kong, the headache wasn’t going away, and it actually started to get a little worse. I knew I had to start doing something about it, and the first step was getting an MRI of my brainio, which according to my doctor friend would show me if there was anything seriously wrong. Anyhoo, so I get the MRI, and I’m at the counter paying for it ($700, which is quite a deal compared to the 8 grand I would later find out it costs at Cedars Sinai) when I decide to poke my head back into the lab to see if I can see anything on the computer screen that shows the insides of my brains. As I look through the door, a technician is hanging up a film that looks like it’s got brains on it. I move in closer, look at the film, and the first thing I notice is my name on the bottom right. The second thing I notice is that weird glowing ball of darkness you can see on the last two rows of images. I point to it. “What’s that?” I ask, knowing it was a brain tumor. “I no a docta!” says the technician. I saw it myself. Plain as day. And to be honest, more than anything it was a relief to finally figure it out, to realize THAT THING is what’s been causing the freaking month-long headache. By the time I got back to the lab to pick up the MRI films and DVD (they put a digital copy of the images on a disc for you which you can look at in 3D on your computer — it’s pretty awesome) the phone was ringing. It was Dr. Chang, the neurologist who had referred me to this lab (not to be confused with Doctor Chan, the Man Who Would Operate On My Brain–old Jonny Slow Hands). Dr. Chang knew I was supposed to fly home to LA the next day, so he had called the clinic hoping to be able to speak with me. They hand me the phone. So the crux of all of this was that I now knew that a) I had a brain tumor, and b) it clearly needed to come out. So that is why I had brain surgery in Hong Kong. Oh. I ‘spose I could have scrolled up to find out.